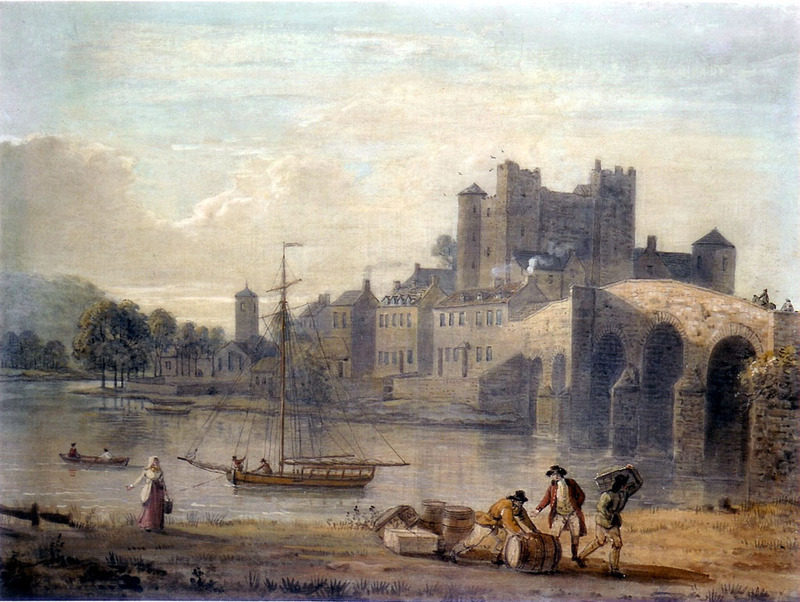 A view of Enniscorthy and the bridge, County Wexford, with figures unloading a boat. Provenance: an early 19th century label of Tooth’s Depository of the Arts, Lincoln, is attached to the reverse. Paul Sandby was born in Nottingham, the son of a “frame-work knitter” (probably a small-scale manufacturer rather than a labourer), and came to London with his younger brother, the architect Thomas Sandby, in 1747. He obtained a post in the Drawing Room of the Department of Ordnance, and subsequently became a topographic surveyor for the Ordnance Survey in the aftermath of the “45”, and was in Scotland from 1747 – 1752, where, in Edinburgh, he learned etching. On his return to London in the Spring of 1752, he obtained a post at Windsor, where he became a pioneer in the tradition of the English natural landscape. He was a popular and well-patronised watercolourist and became drawing-master to a number of wealthy amateurs. He was the first artist to use the acquatint process in England. He regularly undertook drawing expeditions to the picturesque parts of the kingdom, including Wales and the North of England. In 1768 he was appointed chief drawing master of the Royal Military College at Woolwich, the same year as his election as a Royal Academician. In the 1770’s Sandby was inspired by the gouaches of Marco Ricci in George III’s collection, and more of his work was undertaken in that medium, in a tonality notably livelier than in his early work A small number of watercolours and gouaches of the east coast of Ireland survive, and it seems likely that he made a visit in or about 1778, as another painting of Carrick Ferry (also in Co. Wexford) was engraved for “The Virtuosi’s Cabinet” in 1780. No details of his visit have survived. During this period Sandby enjoyed the patronage of the opulent Air Watkin Williams-Wynn of Wynnstay, Sir Joseph Banks and Charles Greville, son of the Earl of Warwick. Sandby had married in 1757 Anne Stogden; their son Paul eventually succeeded his father as drawing-master at Woolwich. The largest collections of Sandy’s work are in the Royal Collection at Windsor and in the Castle Museum, Nottingham. Enniscorthy is a small town in the north of County Wexford which grew up around the Castle which was crenellated by the Prendergast family in 1205, and which was the home of the poet Edmund Spencer in the 16th century. A Franciscan Friary was established on the riverbank to the south of the castle in 1459. The small town was purchased en bloc by Sir Henry Wallop in 1585, and it remained in that family Subsequently Earls of Portsmouth) for very many years. Cromwell passed through the town on his way to Wexford in 1649; within a few years, in 1654, a pottery had been established at Carley’s bridge. The present bridge, seen in Sandby’s gouache, was constructed by the Oriel brothers in 1775, thus giving a terminus ante quem for the dating of the picture.